Dry sandy open ground (plains, barren spots, ridges, banks), often with jack pine and oaks; crevices in rock outcrops on both summits and shores in the Lake Superior region. The fresh leaves are darker (more of a blue-green) than in V. labradorica, and thicker in texture. Their shape is more easily used to distinguish the two species than it is to describe. In the jack pine plains and elsewhere in the Lower Peninsula, plants nearly always show at least some minute pubescence on peduncle, petioles, and blades (at least on the main veins and margins). Glabrous plants are found in the Lake Superior region. 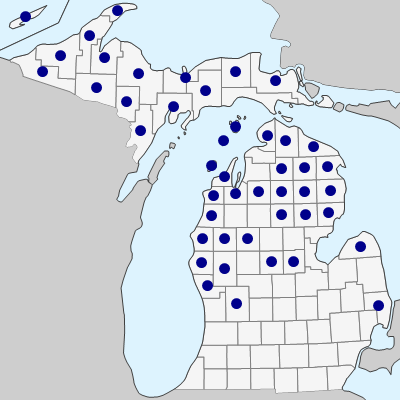 Apparent hybrids with V. labradorica are known from Alpena Co. and Bois Blanc Island (Mackinac Co.), and perhaps elsewhere. MICHIGAN FLORA ONLINE. A. A. Reznicek, E. G. Voss, & B. S. Walters. February 2011. University of Michigan. Web. 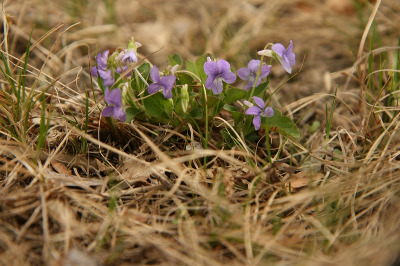 April 24, 2019. https://michiganflora.net/species.aspx?id=2776.